Iran’s 10th presidential elections, held on 12 June 2009, saw a much disputed victory of incumbent Mahmoud Ahmadinejad over opposition candidate Mir-Hossein Mousavi. 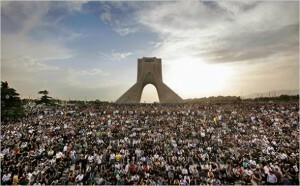 As reports of voting irregularities grew, millions of Iranian Green reformists took to the streets in protest.Within a few days, traditional media was banned and international satellite broadcasts were jammed, in an attempt to stifle video footage of government violence targeting opposition supporters. 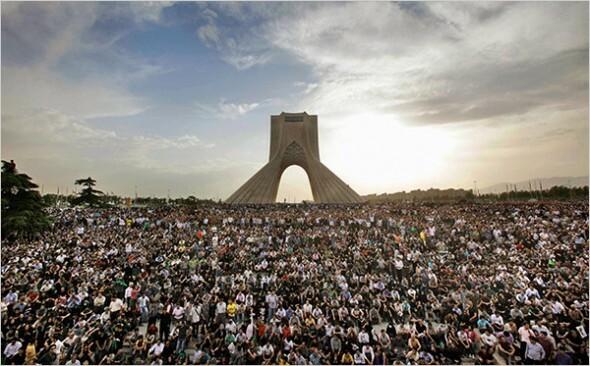 In demanding their voices be heard, Iranian citizen journalists took to the Internet. One of the most dangerous aspects of the Iranian regime is that it has complete control over internet access in the country. Every local Internet Service Provider is routed through the infrastructure of the state-owned Telecommunication Company of Iran which means they have the ability to track each packet sent and received by a computer in the country. In light of the post-election censored climate, 2010 Media Guardian Innovator of the Year Award winner Austin Heap and business partner Daniel Colascione of the Censorship Research Center, created Haystack. This proxy server system tricked the not-so-tech-savvy Iranian regime, which has according to Heap, made it “illegal for people to have an opinion, to have a conversation.” Haystack uses mathematical formulas to hide users real Internet traffic within a stream of innocuous requests. Heap explains: “Instead of connecting from Iran directly to Facebook, for example, which they block, you connect from Iran to Australia then to Facebook.” But the Iranian regime figured a way to tap into the proxies. Fighting harder this time, Haystack pushed the regime “all the way up against the wall,” hiding encrypted data inside official government traffic.